A trade union is simply about people getting together. Experience informs them that as an individual worker they may have little or no say in what happens to them. So when women and men talk to each other, moan about wages, criticise the conditions in which they have to work – they inevitably conclude that they will have to organise themselves into a collective, simply to get their voices heard. Essentially that’s all a trade union is about. In the UK and Ireland since humans were replaced by sheep or wheat and driven from the land into towns and cities to work in the emerging factory system, these groups of workers realised that they had to be more organised, so they formed trade unions. Of course, trade unions nowadays are sophisticated, complex organisations. UNITE has well over 1 million paying members, 66 fully equipped offices in all of the regions and countries of the UK and Ireland. We also have an office in Gibraltar and a 126 bedroom hotel and conference centre (The View) and a stately home in Surrey near Heathrow airport with over 50 bedrooms, first-class education and conference facilities. Our financial income from membership subscriptions is in excess of £200 million per annum. Nevertheless the job as a trade union is straightforward. That is: – we do NOT allow employers to use their power to treat their employees, our members, badly. Everything that we do as a trade union is based on having an active membership with well-trained workplace representatives. That is why getting young members involved, enthusing them to be active at their place of work is the priority of UNITE the union. To that end, one of our young members, Blaine Kilgallon, has written this excellent guide for you. Understanding the structure of your union (and the jargon we use) will make your involvement and activity a lot easier – and enjoyable. This guide provides invaluable knowledge for any trade unionist, young and old. The idea for this pack arose after Blaine Kilgallon (author of this guide) and I attended a Unite Young Members’ Education Course as guest speakers and we were asked why there was no literature which detailed Unite structures in an easy and accessible way. As the newly appointed National Youth Coordinator it is my priority to ensure that the voice of every young member is heard within our union. It is important that our structures are understood. The aim of this guide is to provide knowledge, to empower our young members and to encourage them to play an active and defining role in Unite. As a young man on the Liverpool docks, one of the significant “rites of passage” for me was to not just be a member of the union but to get actually involved. This was a wonderful experience for me. So much so, that I threw myself into loads of activities within my own workplace, within Merseyside and the wider trade union and Labour Movement. These were very exciting times and through my involvement in the union, I had the opportunity to develop my understanding of the world of work and how it impacts on the wider political scene. As you can imagine this was not straightforward and at times it was difficult to get my voice, and those of other young women and men, heard. And we had lots to say. I’ve given a commitment since becoming General Secretary that it is paramount that we encourage our members to get involved in Unite. For that reason we have created lots of avenues for our members to be active in the affairs of the union. This guide has been put together by the National Young Members Committee so that you could have a clear understanding of how the union works. I do appreciate that when you look at a diagram of the union, the structures look complex and forbidding. The reverse is true. Structures have been developed by activists in order that they can have their say on many different levels and through many different channels. Over the years we’ve opened up the union to take on board the views of young people, members from underrepresented groups, disabled members, women, gay, lesbian and transgender members. And the great news is that in Unite you don’t just have one voice, one channel. Every single member has at least two votes: one based on the industry in which you work (sector) – the other on where you live (territorial). In addition if you’re from an underrepresented group you have an additional channel and vote for your views. This guide concentrates on young trade unionists. You will hear from Anthony Curley, the National Youth Coordinator. Anthony has been employed to lead the elected young activists so that your voice will be heard loud and clear within our organisation. This guide by Blaine Kilgallon is just one of the many tools available to young members to achieve our ambition of making Unite responsive to all its members presently and in the future – YOU. Blaine Kilgallon, 27, is chair of the Irish Young Members Committee and has been a shop steward for the past 7 years in Sainsbury’s. Like so many young people during the recession Blaine has struggled to find work relevant to the degrees, qualifications and skills he has achieved, being paid just above the minimum wage and competing for jobs in a saturated employers market. In November 2013 Blaine undertook a paid internship with Unite to research and develop a young members mentoring programme. Although only given a month to fulfil this task he was able to produce research and a blueprint on how Unite and the wider trade union movement should be engaging, educating and integrating young people/members fully into their structures. Following on from this and numerous productive meetings with the General Secretary, the Director of Education, Irish Regional Secretary and National Young Members Committee, Blaine went on to co-write two motions with the then National Young Members Chair, Anthony Curley which were passed at Young Members Policy Conference in February 2014. These motions committed Unite to develop a full young members’ education programme (regional and national) and an accompanying A – Z glossary of Unite. The Introductory A – Z Guide details and explains Unite’s structures, trade union jargon and terminology. This educational text is a step towards the fulfilment of these motions and will not only help young members, but all members in Unite to understand their union, making it more clear, open and appealing. This text would not have been possible without the input and support of Len McCluskey (General Secretary), Jim Mowatt (Director of Education), Kenny Barron (Head of Lifelong Learning), Jimmy Kelly (Irish Regional Secretary), Brendan Ogle (Irish Education Officer) Clare Caulfield (Union Learning Organiser), Anthony Curley (National Youth Coordinator) and Unite Young Members. Abstention – declining to vote for or against a proposal or motion. Addendum (for a motion) – is the proposed addition to be made, or made to a motion. Addenda are mostly seen beside motions on agendas for conferences (see Motion). Advisory, Conciliation and Arbitration Service (ACAS) – is a non – departmental body of the U.K. government which provides information, advice, training, conciliation and other services for employers and employees to help prevent or resolve workplace problems. Agency Worker – an agency worker (often referred to as a ‘temp’) is someone who has a contract with the temporary work agency (an employment contract or a contract to perform work personally) but works temporarily for and under the direction and supervision of a hirer. Affiliate – Unite are affiliated with several other union organisations both nationally and internationally. Most notable affiliations are to the Trade Union Congress (TUC), Irish Congress of Trade Unions (ICTU) and European Trade Union Confederation (ETUC). Unite also affiliate to other organisations and campaigns which are in line with union policy. Allied Irish Bank (AIB) – is the bank in the Republic of Ireland that is used for the purposes of Unite branch accounts and banking. Amalgamated Engineering and Electrical Union (AEEU) – one of the unions that became Amicus, one of the two unions that came together to form Unite. Amalgamated Transport and General Workers’ Union (ATGWU) – was another name for the Transport and General Workers Union (T&G/TGWU), particularly in Ireland as not to cause confusion with the Irish Transport and General Workers Union (ITGWU), now SIPTU (see Transport and General Workers Union). Amendment (for a motion) – is the alteration proposed to be made, or made to a motion. Amendments are mostly seen beside motions on agendas for conferences (see Motion). Amicus – from the Latin meaning friend or comrade, was created by merger of the Manufacturing, Science and Finance (MSF) union and the Amalgamated Engineering and Electrical Union (AEEU) in 2001. In 2004 both the Union for the Finance Industry (UNIFI) and Graphical, Paper and Media Union (GPMU) merged with Amicus. In May 2007, Amicus merged with the Transport and General Workers Union (TGWU/T&G) to form Unite the Union. Annual General Meeting (AGM) – is a statutory meeting of a branch and its members that is to be convened once a year and where reports, necessary elections and any other branch/union business is to be conducted. Appeal – when an employee feels that disciplinary action taken against them is wrong or unjust, they may appeal against the decision. Apprentice – is a person who is learning a trade from a skilled employer, having agreed to work for a fixed period on a lower rate of pay. Apprenticeship – is an age old system of training a new generation of practitioners of a trade or profession with on-the-job training and often accompanied with classroom study. Apprenticeships can last between one to four years depending on the profession. Arbitration – involves an impartial outsider being asked to make a decision on a dispute. The arbitrator makes a firm decision on a case based on the evidence presented by the parties. Arbitration is voluntary, so both sides (in this context Trade Unions and Employers) must agree to go to arbitration; they should also agree in advance that they will abide by the arbitrator’s decision. Area Activists Committee (AAC) – is composed of activists in different companies, sectors and branches across the specific geographical area within the region which it covers. The Area Activist Committee meetings have a strategic geographical focus– concentrating on the industrial and community situation in the geographical area it covers and set a local strategic agenda, including an organising strategy within the parameters of national policy. Assistant General Secretary (AGS) – Unite currently have four Assistant General Secretaries. The Assistant General Secretaries are appointed by the General Secretary and endorsed by the Executive Council. The Assistant General Secretaries oversee the running of their allocated sectors and report to the General Secretary and the Executive Council. Ballot – a system of voting secretly and in writing on a particular issue, for example balloting for industrial action. Introduced into democracy by Trade Unions to protect their members from victimisation by employers. Benevolent Grant – is granted to a member from the Unite the Union Benevolent Fund. Benevolent grants may also be agreed upon and donated by regional committees and branches. Benevolent Fund – the Unite the Union Benevolent Fund is the benevolent fund for Unite the Union members and employees and their immediate dependents. Black Asian Ethnic Minorities (BAEM) – race equality is a key priority in the workplace and beyond. Unite campaigns for fair treatment for all and recognises the responsibility of everyone in the Union to challenge racism in the workplace, the union and our society. BAEM workers face higher levels of unemployment and racism at work and Unite Race Forward Campaign action plans are targeted at union reps to support them in tackling racism in the workplace. Black Asian Ethnic Minorities (BAEM) Committee – there are regional and national BAEM committees made up of elected representatives who deal with issues pertaining to BAEM members in the workplace, community and society. Black Asian Ethnic Minorities (BAEM) Conference – there is to be a BAEM Regional Conference every three years and a BAEM National Conference every two years to be convened by the Regional Secretary and Executive Council respectively. The conferences will determine BAEM policy and strategy regionally and nationally until the next conferences take place. Blacklisted – is an employers’ list or register of people who, for being a member of a trade union, are being denied a particular job, privilege, service, access or recognition. Branch – is a union structure organised to represent the union’s members from a particular geographic area, workplace, company, community or retired members. Every member of Unite is in a branch. (see Community Branch, Composite Branch, Geographical Branch, Retired Members’ Branch and Workplace Branch). Branch Donation/Grant – Branches can make donations/grants to individual members, charities and union affiliated organisations in line with policy of the union. Branch Funds – Branches receive 7.5% of core membership subscription rate into their individual branch funds. A further 2.5% of the branches core membership goes into a central strike fund (see Strike Fund). Branch Levy – is when a branch decides to collect an agreed tariff from the branch membership dues for purposes of the branch e.g. branch recruitment fund, campaign and organising fund. Branch Officials – are the democratically elected officers of a branch and are responsible for the running of the branch and branch administration – calling meetings, conducting of branch business and branch finances. Branch Officials include Chair, Vice Chair, Secretary, Treasurer and Equality Officer. Centre for Labour and Social Studies (CLASS) – is a trade union financed think – tank established in 2012 to act as a centre for left debate and discussion. Originating in the labour movement, Class works with a broad coalition of supporters, academics and experts to develop and advance alternative policies for today. Chair – The chair (chairperson) is the elected official of a committee or branch who is charged with facilitating meetings, such as branch and committee meetings. The chair agrees the agenda for meetings with the secretary (of the branch/committee) and make sure that business is properly conducted in line with union democracy and policy. Chief of Staff – is responsible for most of the Unite’s central departments and for its ten regions. Closed Shop – in union-management relations, is an arrangement whereby an employer agrees to hire—and retain in employment—only persons who are members in good standing of the trade union. Such an agreement is arranged according to the terms of a contract. Combine – term used to describe a committee from various plants of shop stewards in a major company. Community and Youth Workers’ Union (CYWU) – can be traced back through various predecessor unions to 1938. In January 2007, after a national ballot, the CYWU merged with the Transport & General Workers’ Union (T&G) to become the CYWU/T&G. Later that year after the T&G and Amicus merged to become Unite the Union, the union became CYWU, Youth, Community & Playworkers in Unite. Community Branch – is made up of community members and linked into Area Activists Committees to address issues that affecting respective communities. Community branches are supported by the regional and industrial structures of the union. Community Member – community membership was established in December 2011 in order to address the increasing number of individual trade unionists outside the traditional union structures. Collective Agreement – where collective bargaining involving a trade union has led to an agreement, for example a pay increase, these agreements are called collective agreements. Collective Bargaining – once a trade union is recognised in a workplace, the negotiations they have with the employer are called collective bargaining; these negotiations will be regarding terms and conditions of employment. Collective Conciliation – in resolving workplace disputes, is a specific term used to refer to talks between trade unions (other representative groups) and employers, facilitated by an independent third party. ACAS is often brought in to provide conciliation services for this type of situation. Composite Branch – is a branch composed of several different workplaces and sites. Compulsory Redundancy – is when an employer decides to make an employee(s) compulsory redundant due to skills, qualifications and aptitude, standard of work and/or performance, attendance and disciplinary record. Employers can also select employees based on their length of service (‘last in, first out’) but only if can be justified (see Redundancy). Conciliation – is a method of helping the parties in an industrial dispute reach agreement. Reaching an agreement about a workplace dispute without going to court is known as Early Conciliation. Consultation – is the free exchange of ideas and views affecting the interests of employees and the organisation. Management and unions sometimes place some limits on the range of subjects open to consultation, for example: because of trade confidences or because they are considered more appropriate for a negotiating forum. To avoid misunderstandings and the possibility of industrial relations difficulties it is advisable for management and recognised unions to agree on the issues that will be the subject of consultation. Consultation Period – is the time period for consultation between trade unions and an employer in the event of an employer making 20 or more employees redundant. The discussions will entail the reasons for redundancies, how to keep the number of dismissals to a minimum and how to limit the effects for employees involved, e.g. by offering retraining. Contract – all employees have an employment contract with their employer. A contract is an agreement that sets out an employee’s: employment conditions, rights, responsibilities and duties. These are called the ‘terms’ of the contract (see Terms and Conditions). Convenor – a senior trade union representative in a workplace who undertakes mostly trade union duties and activities on site. Convenors are utilised in workplaces that employ a large number of people and have a high trade union density and usually enjoy 100% trade union facility time. Delegate – is an elected member authorised to represent a group of members at particular meetings, conferences and congresses. Deregulation – is the process of removing or reducing government regulatory controls from an industry, commodity or service. Disciplinary – is formal action by an employer to discipline an employee due to concerns about their work, conduct or absence. Disabled Members’ Committee – there are regional and a national Disabled Members’ committees made up of elected representatives who deal with issues pertaining to disability in the workplace, community and society. Disabled Members in Unite – Unite opposes discrimination against disabled men and women and support practical action for disability equality. Our union represents many disabled workers in workplaces throughout industry, and including in Remploy and supported employment. Challenging discrimination, bullying and harassment of disabled people in the workplace, disability hate crime in the community and winning real equality of opportunity is a priority for our union. Disabled Members’ Conference – there is to be a Disabled Members Regional Conference every three years and a Disabled Members National Conference every two years to be convened by the Regional Secretary and Executive Council respectively. The conferences will determine the disability policy and strategy of Unite regionally and nationally until the next conferences take place. Discrimination – when an employer treats one employee less favourably than others. It could mean a female employee being paid less than a male colleague for doing the same job, or an employee from a minority ethnic community being refused the training opportunities offered to other colleagues. There are laws against discrimination on the basis of your gender, marriage or civil partnership, gender reassignment, pregnancy and maternity leave, sexual orientation, disability, race, ethnic background, nationality, religion or belief and age. Eastbourne Centre – Unite’s 150 bed hotel, training and conference centre in Eastbourne. Education – where union representatives and members can avail of free training courses across the United Kingdom and Ireland. You can also apply for a union bursary to help with your education and explore pathways to union linked further and higher education programmes. Election – the selection by democratic vote of the Unite membership, a person or persons from among proposed candidates for positions such as branch officials, members of committees, chair/vice chair of committees, Executive Council members and General Secretary. Employment Appeal Tribunal (EAT) – in the U.K the main function of the Employment Appeal Tribunal (EAT) is to hear appeals from decisions made by Employment Tribunals. Employment Appeals Tribunal (EAT) – in the Republic of Ireland, is an independent body bound to act judicially, and was set up to provide a fair, inexpensive and informal means for individuals to seek remedies for alleged infringements of their statutory rights. The EAT is a statutory body established to deal with and adjudicate on employment disputes under the statutes in the Republic of Ireland. Emergency Motion – is a motion that is presented at a union meeting or conference without the normal requisite notice period being required for submission. At a conference the motion will approved by the Standing Orders Committee (SOC) before being agreed by conference to put the motion on the agenda. It is a special motion used for considering and acting upon an issue which has arisen suddenly. Employment Tribunal – in England, Scotland and Wales is a tribunal that rules on disputes between employers and employees regarding unfair dismissal, redundancy etc. (see Industrial Tribunal, Employment Appeal Tribunal and Employment Appeals Tribunal). English for Speakers of Other Languages (ESOL) – Unite’s ESOL programme helps members whose first language isn’t English, improve their English covering topics of speaking and listening, reading and writing, vocabulary and punctuation and grammar. Unite’s programme can help members in the classroom and on an online format. Environmental Representative – is democratically elected from the membership to represent the workforce, where applicable, in discussions and negotiations regarding the development and implementation of company / employer environmental policies and practices. Equality – is defined as the state of people being equal in status, rights and opportunities. Unite is firmly committed to equality for all, and members of our union reflect the diversity within our communities. Equality at work and in society is a key priority for Unite. Unite make clear that we should challenge discrimination, harassment and bullying at all times and promote equality for all. Equality Sectors – Unite’s Equality sectors include Women, Black Asian & Ethnic Minorities (BAEM), Lesbian Bisexual Gay and Trans (LBGT), Disabled Members, Young Members and Retired Members. Unite is firmly committed to equality for all and the equalities structures ensure full representation and involvement of our diverse membership. Equality Representative – is democratically elected from the membership to represent the workforce in discussions and negotiations with the employer regarding equality issues, policies and practices. Esher Place – Unite’s flagship training and conference venue in Surrey, Essex for Unite members. Essential Skills – are free nationally recognised qualifications for adults in English, Math and ICT and can be achieved at a range of different levels, from beginners to achievement at Level 2, which is comparable to GCSE. Unite’s Union Learning Organisers (ULO’s) can help establish these courses in the workplace, through the direction of workplace Union Learning Rep (ULR) and in the community. European Union (EU) – is a unique economic and political partnership between 28 European countries that together cover much of the continent. The EU was created in the aftermath of the Second World War. The first steps were to foster economic cooperation: the idea being, that countries who trade with one another become economically interdependent and so more likely to avoid conflict. The result was the European Economic Community (EEC), created in 1958, and initially increasing economic cooperation between six countries: Belgium, Germany, France, Italy, Luxembourg and the Netherlands. European Works Council (EWC) – around 10 million workers across the EU have the right to information and consultation on company decisions at European level through their EWCs. They give representatives of workers from all European countries in big multinational companies a direct line of communication to top management. They also make sure that workers in different countries are all told the same thing at the same time about transnational policies and plans. They give workers’ representatives in unions and national works councils the opportunity to consult with each other and to develop a common European response to employers’ transnational plans, which management must then consider before those plans are implemented. Executive Council (EC) – is the governing body of Unite the Union made up of democratically elected lay members, known as Executive Council Representatives, from sectors, regions and equalities. The Executive Council meet for a week, four times a year (once a quarter) to discuss and debate the running of the union. The Executive Council is sometimes referred to as the National Executive Council (NEC). Executive Officer – is in charge of National Organising and Leverage Department, strategy for growth, organising and leverage campaigns. Ex officio – is Latin for ‘from the office’ and in trade unionism means a member who is on a committee because they are employed official of the union or member of the Executive Council. E.g. – The elected member of the Executive Council for the region is an ex offico member on the regional committee. Expenses – are payments from the union and union branches to officials and union reps to offset official/member expenditure due to travel, accommodation, loss of earnings and meals while conducting official union business on behalf of the membership. Facility Time – trade union facility time and facilities are the time and workplace resources (such as computers, telephones, photocopiers, access to meeting and/or office rooms) that trade unions negotiate from employers so that they are able to properly represent members, individually and collectively, at work. Factory Floor – means among the workers/members in a factory, rather than management. Fair Employment Tribunal – is an independent judicial body in Northern Ireland that hears and determines complaints of discrimination on the grounds of religious belief or political opinion. Finance and General Purposes Committee (F&GP) – sub committees of elected lay members from regional committees and the Executive Council charged with overseeing the Unions financial affairs in the regions and nationally on behalf of the members and to give consideration and advice on union business of particular importance. Fixed Term Contract – is when employees have an employment contract with the organisation they work for and their contract ends on a particular date, or on completion of a specific task, e.g. a project. Framework Agreement – term used to refer to an international accords or alliance. These agreements refer to different bodies and organisations such as countries, governments, companies and trade unions. Full – Time Official – is another term used generally to refer to an officer employed by the union (see Regional Industrial Officer (RIO)). General Secretary (GS) – is the democratically elected chief officer and leader of Unite the Union. Geographical Branch – is a branch composed of workplaces and sites within a specific geographical area. Global Union Federation (GUF) – are international federations of regional and national trade unions organising in specific industrial sectors. Most unions like Unite are members of one or more global union federations, relevant to the sectors where they have membership (see Global Union Federation p.46). Globalisation – the rapid and huge increase in the amount of economic and political activity taking place across global borders. Globalisation and all it encompasses including deregulation, privatisation and outsourcing has created and aided in a ‘race to the bottom’ (see Deregulation, Privitisation. Outsourcing and Race to the Bottom). Graphical, Paper and Media Union (GPMU) – one of the unions that became Amicus, of which was one of the two unions that came together to form Unite. Grievance – if a worker has tried to solve a problem or concern informally by talking to a manager but is still not satisfied, they can make a formal grievance complaint in writing. The employer should have a written grievance procedure that explains what to do and what happens at each stage of the process. After raising the grievance the employee will have a meeting to discuss the issue with the union rep and the member(s). Health and Safety (H&S) – is the term applied to regulations and procedures intended to prevent accident or injury in workplaces or public environments. Health and Safety Authority (HSA) – is the national statutory body in the Republic of Ireland with responsibility for ensuring that workers (employed and self-employed) and those affected by work activity are protected from work related injury and ill-health. This is done by enforcing occupational health and safety law, promoting accident prevention, and providing information and advice across all sectors. Health and Safety Executive (HSE) – is a non-departmental public body of the United Kingdom and is the body responsible for the encouragement, regulation and enforcement of workplace health, safety and welfare, and for research into occupational risks in England and Wales and Scotland. Responsibility in Northern Ireland lies with the Health and Safety Executive for Northern Ireland. Health and Safety Representative – is democratically elected from the membership to represent the workforce in discussions and negotiations with employer regarding health and safety issues, policies and practices. Union safety reps enjoy specific statutory rights. Holiday Entitlement – in the U.K all workers, with the exception of self-employed workers, are legally entitled to 5.6 weeks’ paid holiday per year (also known as statutory leave entitlement or annual leave). The limit on holiday entitlement is 28 days and an employer can include bank holidays as part of statutory annual leave. In Ireland holiday entitlement is set out in legislation and in the employment contract of employment. Under law, the basic annual paid leave entitlement is 4 weeks. Holiday Pay – Workers are entitled to a week’s pay for each week of leave they take. A week’s pay is worked out according to the kind of hours someone works and how they’re paid for the hours. Industrial action is ‘official’ if it is formally backed by a trade union and members of that union are taking part in it. Industrial Sectors – Unite represent members in 21 industrial sectors. See Unite’s Industrial Sectors p.42. Industrial Tribunal – in Northern Ireland, Industrial Tribunals hear cases involving employment disputes (see also Employment Tribunal and Employment Appeals Tribunal). International Labour Organisation (ILO) – is a global body that gives an equal voice to workers, employers and governments in a tripartite to ensure that the views of the social partners are closely reflected in labour standards and in shaping policies and programmes. The main aims of the ILO are to promote rights at work, encourage decent employment opportunities, enhance social protection and strengthen dialogue on work-related issues. International Solidarity – Unite and its members are becoming increasingly engaged in action to support workers and communities across borders and continents in international solidarity campaigns justice as Justice for Columbia and Cuba Solidarity Campaign. Unite also helped initiate the joint Union Solidarity International (USi). Internship – is a temporary position with an emphasis on on-the-job training and learning rather than merely employment and it can be paid or unpaid. Over the past couple of year’s Unite have advocated Unite internship schemes which offer people a three month contract and being paid the Living Wage. Institute of Employment Rights (IER) – is a think tank for the labour movement and a charity. It exists to inform the debate around trade union rights and labour law by providing information, critical analysis, and policy ideas through our network of academics, researchers and lawyers. Irish Congress of Trade Unions (ICTU) – is the congress of trade unions on the island of Ireland and is the largest civil society organisation in Ireland, representing and campaigning on behalf of some 778,000 working people. There are currently 55 unions affiliated to Congress, north and south of the border (See Northern Ireland Committee Irish Congress of Trade Unions (NIC – ICTU)). Irish Executive Committee (IEC) – in accordance with Rule 24 of the union, the Irish region has an Irish Executive Committee instead of a regional committee. The IEC make decisions in matters of an industrial and political nature which arise out of and in connection with the economic or political condition of the Republic of Ireland or Northern Ireland and which are of direct concern to members of the Union resident in the Republic of Ireland or Northern Ireland. Irish Policy Conference (IPC) – in accordance with Rule 24 of the union, in alternate years to the Union’s Policy Conference there is an Irish Policy Conference. At the IPC Unite lay member delegates from Area Activist Committees, industrial sectors and equalities discuss, debate and vote to change, modify and adopt policies for Unite in the Irish Region. Joint Shop Stewards Committee – refer to a committee of shop stewards from more than one union which represent members in the same company or industry. No words or phrases applicable. Labour Movement – term for the development of a collective organisation of working people in trade unions and sympathetic political parties. Together they campaign for better working conditions and treatment from their employers and governments, through the implementation of labour and employment law. Traditionally in the United Kingdom and Ireland the political arm of the labour movement is the Labour Party (see also Labour Party (UK) and Labour Party (ROI)). Labour Party (UK) – is a centre-left political party in the United Kingdom. It grew out of the trade union movement and socialist political parties of the nineteenth century. The party contains a diversity of ideological trends from strongly socialist, to more moderately social democratic. Unite is the largest of 15 trade unions affiliated to the Labour Party and is the biggest financial donor. Labour Party (ROI) – is a political party in the Republic of Ireland. The party was founded in 1912 by James Connolly, James (Jim) Larkin and William O’Brien as the political wing of the then Irish Trade Union Congress (ITUC) (N.B. – As of June 2013, Unite the Union no longer affiliate to the Labour Party in The Republic of Ireland). Labour Relations Agency (LRA) – is a non-departmental statutory public body with responsibility for promoting the improvement of employment relations in Northern Ireland. The agency is independent of government and is funded mainly in the form of a grant from the Department for Employment and Learning (DEL). Labour Relations Commission (LRC) – is an independent statutory body in the Republic of Ireland with purpose of discharging its general responsibility for promoting good industrial relations. The commission provides a range of industrial relations advisory and mediation services to meet the particular demands of employers, employees and trade unions. Lay Office – are non-salaried positions of office on the Executive Council and/or any committee, council, or other body of the Union provided for by the rules, where the member must be an accountable representative of workers. Learn with Unite – is an arm of the Education Department which identify and create flexible learning opportunities for members and potential members, which enables them to embark on a learning journey of their choice. The Lifelong Learning teams work with Union Learning Representatives (ULR) in creating robust relationships with employers and education providers, underpinned by learning agreements. Learn with Unite also has its own virtual learning platform offering support and supervision to members and activists through the provision of quality online learning opportunities such English, Maths, ICT and English for Speakers of Other Languages (ESOL). Lesbian Gay Bisexual & Trans Committee (LGBT) Committee – there are regional and a national LGBT committees, made up of elected representatives which deal with issues pertaining to LGBT members in the workplace, community and society. Lesbian Gay Bisexual & Trans Conference (LGBT) Conference – there is to be a LGBT Regional Conference every three years and a LBGT National Conference every two years to be convened by the Regional Secretary and Executive Council respectively. The conferences will determine LGBT policy and strategy regionally and nationally until the next conferences take place. Lesbian Gay Bisexual & Trans members (LGBT) in Unite – LGBT equality in the workplace continues to be hard fought for. Many LGBT workers face harassment and discrimination based on sexual orientation and gender identity. Unite are raising awareness and campaigning for LGBT equality, and encourage LGBT workers to join and become active in the union. Leverage – is a process whereby Unite commits resources and time to making all interested parties aware of the treatment received by Unite members at the hands of an employer. Those interested parties may include shareholders of the employer, competitors of the employer, communities within which the employer operates, customers of the employer and the market place of the employer. This strategy is undertaken by the National Organising and Leverage Department and concentrates on the company’s supply chain. Living Wage – is calculated according to the basic cost of living in the UK, which is an hourly rate set independently and updated annually. Employers choose to pay the Living Wage on a voluntary basis; however it has cross party support and is good for business, good for the individual and good for society. Lockout – is the tactic of withholding employment, typically used by employers to hinder union organisation or to gain leverage in labour disputes. It is often accomplished by literally locking employees out of the workplace, but it can also be achieved through work stoppage, layoffs, or the hiring of non – union replacement workers. Lifelong Learning – See Learn with Unite. Mediation – is a voluntary and confidential form of alternative dispute resolution. It involves an independent, impartial person helping two or more individuals or groups reach an acceptable solution. Collective mediation is a specific term used to refer to talks between trades union and employers, facilitated by an independent third party, usually ACAS. Membership – the members of the union. Membership Contribution Rate – is the amount a member contributes to the union every month to avail of the representation and services provided by the union. Migrant Worker – the term in public debate and usage is extremely loose and often conflates issues of immigration, race/ethnicity, and asylum. The United Nations‘ definition is broad, including any people working outside of their home country. Motion – is a formal written proposal put before a branch, committee, Executive Council, Policy Conference or Congress on which members vote in favour of, against or abstain or amend to form a composite motion. A motion is moved by a mover and endorsed by seconder, either from the rostrum or formally from the floor. National Finance and General Purposes Committee (F&GP) – subcommittee of elected lay members of the Executive Council charged with overseeing Unite’s financial affairs on behalf of the members and to give consideration and advice on any other union business of particular importance. National Industrial Sector Committee (NISC) – is made up of elected representatives from the Regional Industrial Sector Committees to discuss and debate national issues within respective workplaces and the sector. Where applicable the committee may elect a delegate to represent the sector and Unite on respective sectoral European Trade Union Federation (ETUF). National Officer – are employed officials of Unite who represent members nationally in an allocated sector and equalities. National Officers are responsible for liaising and negotiating with national companies, National Industrial Sector Committees (NISC’s), Combines and National Committees. National Officers liaise with other trade unions and affiliated trade union federations nationally and internationally. National Officers report to an Assistant General Secretary and in turn the General Secretary. National Organising and Leverage Department – spearheads the strategy for growth and drives the organising and leverage agenda forward through the structure of Regional Organising Units. National Political Committee – subcommittee of elected lay members of the Executive Council charged with overseeing Unite’s political affairs on behalf of the membership. To be elected on to this committee, representatives must be members of the Labour Party. National Political Fund – Unite’s Political Fund is made up from a small percentage of each member of the unions contributions (unless they state otherwise) which is used to research and develop political strategy and campaigns. Unite the Union’s current policy in the U.K is affiliate to the Labour Party and financial donations to the party are made from this fund. National Representative – is the elected representative from a regional committee to the respective national committee. National Youth Coordinator – is responsible for the coordination and support for the national young members’ strategy, the development of effective regional young member structures and young member organising / campaigning activity. The National Youth Coordinator ensures the delivery of effective structures, campaigns and organising activities at a regional and national level in line with the union’s young members’ strategy and executive policy. National Youth Coordinator reports to an Assistant General Secretary and in turn the General Secretary. Nevin Economic Research Institute (NERI) – is a research organisation in Belfast and Dublin which, at its core, has a vision of the achievement of a better, fairer society. It aims, through the provision of world-class research and analysis, to contribute towards the construction of alternative perspectives and possibilities that will lead to the creation of an economy that works for society. It is supported by a number of unions affiliated to the Irish Congress of Trade Unions (ICTU) including Unite. Northern Ireland Committee Irish Congress of Trade Unions (NIC – ICTU) – is the Office of the Irish Congress of Trade Unions in Northern Ireland and is responsible for all issues affecting nearly 250,000 members in 36 unions. (see Irish Congress of Trade Unions (ICTU)). Observer – a member on a committee or elected to attend a conference, to observe and participate if they so wish, but have no voting rights on motions or proposals at the meetings or conference. .
Organisers– are employees of the Unite with responsibilities to organise workers, plan and put into action recruitment and organising campaigns , visit workplaces as necessary; liaise with activists, stewards, officers and staff, assisting in delivering training as part of organising campaigns, run and action appropriate campaign planning sessions and developing specific campaign material. Organisers work within Organising Units in the ten regions and report to their Team Leaders and subsequently to the regions Senior Organiser. Organising – involves organising groups of workers into Unite so the union can have a bigger influence on the company. In organising, the union is very effective in representing the benefits to our members by fighting for better terms and conditions and health and safety. Organising workplaces is provided by the National Organising and Leverage Department and implemented by the regional teams known as Organising Units. The Organising Units are led by a Senior Organiser who is employed by the union, who manages and co-ordinates the work of the regional teams of Organisers and Team Leaders to organise and recruit workers. The Senior Organiser works closely with the Regional Secretary to execute the implementation at regional level of the agreed nationally determined strategic organising campaign plans. Outsourcing – involves the contracting out of a business and/or services to another party, typically as cost saving exercise for a company/business. Pay As You Earn (PAYE) – established system for the payment of tax through an employer’s payroll. Pensions – is regular payment made during a person’s retirement from an investment fund to which that person or their employer has contributed during their working life. These can be Personal Pensions, Stakeholder Pensions, Workplace Pensions, State Pension, Occupational and Private Pensions. Defined Contribution Pension Scheme is when the money is invested by a pension provider chosen by your employer and the amount you get when you retire usually depends on; how much has been paid in, how long you’ve been paying in and how well the investment has done. Defined Benefit Pension Scheme – also known as ‘final salary’ or ‘salary-related’ pensions give a certain amount each year during retirement. The amount given each year depends on salary and on length of service to the employer. Hybrid Pension Scheme – is a defined benefit scheme, which includes elements of money purchase pension design. Hybrid arrangements come in many forms, but there are two common themes; Sequential and Combination. A sequential hybrid pension scheme is where one specific type of pension benefit is accumulated first and is then followed by the second pension arrangement. A combination hybrid pension scheme can be where pension benefits are built up at the same time in both defined benefit and money purchase elements of the pension scheme. Picketing – is a form of protest where union members gather collectively and commonly outside a place of work. Picket Line – is where picketing union members dissuade fellow workers and other people entering the workplace premises during an ongoing protest. Pride – is annual LGBT events which take place all over the U.K and Ireland, most notably the week long Pride Festival (London) in the run up to the annual Pride parade which is held in June/July. Policy – statements of intent, and are implemented as a procedure and/or protocol within Unite. Unite Policy is dictated by the biennial Policy Conference where lay member delegates vote to change, modify and adopt policy for Unite. Policy Conference – is a biennial event where Unite lay member delegates (from all regions, sectors and equalities) discuss, debate and vote to change, modify and adopt policies for Unite. The Policy Conference is the supreme decision making body of the union. Private Sector – is that part of the economy, which is run by private individuals and groups normally businesses and companies and is not controlled by the state (see Public Sector). Privatisation – is the process of transferring ownership of a business, enterprise, agency, public service, or public property from the public sector (government) to the private sector, a business that operates for a profit. Recently privatisation has been put into practice by governments outsourcing services or functions to private firms. E.g. in the NHS and Royal Mail. Public Sector – part of the economy concerned with providing basic government services. The composition of the public sector varies by country, but in most countries the public sector includes such services such as the police, military, public roads, transport and infrastructure, education and healthcare (see Private Sector). Proportional Representation – is a system within Unite and the wider trade union movement that seeks to create representative committees that reflects the diversity of the union membership in respects of women, BAEM, LBGT, disabled and young members. Quorum – an agreed minimum number of members required to be present in a meeting before it can begin. This is to protect the democratic structures of the union and members from being dictated to by small groups (cliques). Race to the Bottom – is the term used to describe the situation created due to increased globalisation. Companies and countries compete with each other by cutting wages and living standards for workers, and the production of goods is moved to the place where the wages are lowest and the workers have the fewest rights. In essence it is low input (resources and labour) for high output (profit) (see Globalisation). Recognition – means that an employer recognises a trade union and will engage in negotiations on pay and working conditions for the employees. Recognition Agreement – is recognition and representation of a trade union by an employer and the establishment of a framework for consultation and collective bargaining. Redundancy – is when an employer terminates an employee by agreement (Voluntary Redundancy) or without agreement (Compulsory Redundancy) because there is no longer a need for their positions. This might be because the employer is: changing what it does, doing things in a different way, e.g. using new machinery, changing location, closing down or to cut the costs at the expense of workers (see Compulsory Redundancy and Voluntary Redundancy). Regional Co-ordinating Officer (RCO) – is an employed official of Unite who has an allocation of membership which they are responsible for. The RCO is responsible for a number of officers in their region who report to them regarding their own allocations. The RCO reports to the Regional Secretary and regional committee. Regional Committee (RC) – each region of Unite has a Regional Committee of lay members elected from Regional Industrial Sector Committees (RISCs), Area Activist Committees (AACs), and Equality Sections. The Regional Committees have responsibly for the management of Union affairs in the region or country (Ireland (NI & ROI), Scotland and Wales). Regional Community Co-ordinator – is an employed official of Unite who reports to the Regional Secretary and is responsible for organising and developing Unite’s community membership in their respective region through the creation of community branches and community related campaigns. Regional Finance and General Purposes Committee (F&GP) – sub committees of elected lay members from regional committee charged with overseeing Unite’s financial affairs in the region on behalf of the members and to give consideration, advisement on, any other union business of particular importance or complexity in the region. Regional Industrial Sectors Committee (RISC) – industrial sector committee for each of Unite’s sectors in all regions. The committee is made up from elected representatives from different workplaces within the industrial sector to discuss and debate issues within respective workplaces and the sector. From these committees an elected delegate is sent to represent the region at the National Industrial Sector Committee (NISC). Regional Industrial Officer (RIO) – are employed officials of Unite who represent members in allocated workplaces and have responsibilities for overseeing allocated branches, Area Activists and Regional Industrial Sector Committees. Regional Industrial Officers report to the Regional Co-ordinating Officer, Regional Secretary and the regional committee. Regional Officer – See Regional Industrial Officer (RIO). Regional Political Committee – subcommittee of elected lay members of the regional committee charged with overseeing Unite’s political affairs on behalf of the membership in the region. To be elected on to this committee, representatives must be members of the Labour Party. Regional Political Fund – each region has its own political fund which is used to research and develop political strategy and campaigns in the region. Unite the Union in the U.K affiliate to Labour Party and any financial donations would be made from this fund (N.B. Unite has disaffiliated with Labour Party in the Republic of Ireland and no longer make donations to the party). Regional Secretary – is the chief officer of Unite in each of the 10 regions, with ultimate responsibility for the day to day running of the region, officers and staff. The Regional Secretary presides at all regional committee meetings and sub – committee meetings and reports to the Chief of Staff, General Secretary and the Executive Council. Regions – Unite is constituted into 10 regions – Ireland, Scotland, Wales and 7 regions in England based upon the Regional Development Agency boundaries: North West, North East, Yorkshire and Humberside (NEYH), West Midlands, East Midlands, South West, South East and London and Eastern. Gibraltar lies within the jurisdiction of the London and Eastern Region. Remit (a Motion) – instead of going to the vote on a particular motion at a meeting or conference, the respective committee or Executive Council may seek to withdraw or refer it. If the moving branch, respective committee and conference agree to a remit a motion it is withdrawn entirely or its terms and instructions are discussed by the respective committee or Executive Council. Retired Members’ – are active members of Unite who campaign for pensioners’ rights and social justice including the state pension, health and after-care, transport and social care. Unite is committed to recognising the important role and achievements of retired members who have helped create our vibrant union, and their continued participation is vital to ensure our new members understand and learn from the achievements of the past. Retired Members’ Committee – there are regional and a national Retired Members’ committees made up of elected representatives who deal with issues pertaining to retired members in the community and society. Retired Members’ Conference – there is to be a Retired Members’ Regional Conference every three years and a Retired Members’ National Conference every two years to be convened by the Regional Secretary and Executive Council respectively. The conferences will determine Retired Members’ policy and strategy regionally and nationally until the next conferences take place. Retired Members’ Branch – are specific branches set up for retired members of Unite. Retired Members’ Observer – is elected from the respective Retired Members’ Regional and National Committees to be an observer delegate on the Regional Committee or Executive Council. Rule Book – Unite the Union Rule Book, which contains all the rules of the union. Rules Conference – takes place every four years at which Unite lay member delegates from all regions, sectors and equalities discuss, debate and vote to change, modify and adopt rules for the union. Secret Ballot – see Ballot. Secretary – performs the main administrative functions of the branch/committee and is the main contact point for members. The secretary is responsible for dealing with correspondence, liaising with branch chair on agenda items, preparing reports and up-dates for branch, coordinating meetings and minuting and circulating minutes of meetings. Scottish Trade Union Congress (STUC) – is the congress of trade unions in Scotland which represents over 620,000 trade unionists and has 39 affiliated trade unions and 20 Trades Union Councils, representing trade union members in and out of work, in the community and in the workplace, in all occupational sectors and across Scotland. Senior Steward – is democratically elected by the members of a workplace where there are more than three accredited shop stewards and are recognised for by the employer to represent the shop stewards and the respective members. Shop Floor – means among the workers/members on the ground, rather than management. Shop Steward – is democratically elected from the membership to represent the workforce in discussions and negotiations with employer. Shop Steward’s Committee – is a committee of shop steward’s, typically from the same workplace (or sector) who meet to discuss and debate issues regarding the respective employer (employers). Social Dialogue – refers to discussions, consultations, negotiations and joint actions involving governments, businesses, trade unions, community groups and charities. Social Partners – the social partner organisations represent the interests of workers and European employers. Social Partnership – was the tripartite, triennial national pay agreements reached in the Republic of Ireland between the Government, main employer groups like the Irish Business and Employers’ Confederation (IBEC) and the trade unions, members of the Irish Congress of Trades Unions (ICTU). Standing Orders – are the rules of debate, the agenda and code of conduct for conferences. The standing orders for conference(s) are drafted by the Executive Council and give instruction regarding the composition and deadlines for motions and the correct procedures to be respected and adhered to by members during conference. Standing Orders Committee (SOC) – are elected by member delegates at conferences from each of the regions. The purpose of the committee is to advise on procedure and considers every motion and amendment put forward to conference and emergency motions received during conference. Standing Orders Committee does not make the rules for conference but makes recommendations to conference. It tries to allow conference to achieve full and fair debate on the agenda within the rules of the union and the standing orders of conference. Strike – is the withdrawal of labour/work as a form of organised protest, typically in an attempt to obtain a particular concession or concessions from their employer. Strike Action – see Industrial Action. Strike breaker – is a person who works despite an ongoing strike. Strike breakers are usually individuals who are often not employed by the company prior to the trade union dispute, but are hired after or during the strike to keep the company, business or organisation running. Strike breakers are sometimes referred to as Scabs. Strike Committee – is a committee set up to handle the various planning responsibilities for strike/industrial action. Some of the committees have individuals responsible for certain aspects of the strike like such; negotiating, social media and publicity campaigns, spokesperson or financial and/or fundraising for the members on strike. Strike Fund – is a reserve of money, from a small percentage of each member of union contributions set up by Unite to make payments and show solidarity to workers who are on strike to help in meeting their basic needs and any resources they may require for the duration of the strike. Subs – common term used for union membership contributions (see Membership Contribution Rate). Swedish Derogation – is an opt-out clause from European legislation that is intended to give contractors the same employment rights as equivalent permanent employees. It means that the Agency Workers Regulation rights to equal pay and conditions of an agency worker are negated when agency workers are employed on a permanent basis by an umbrella company (or temporary work agency) as long as they are paid between contract assignments. Terms and Conditions (T&C’s) – are the agreed terms and conditions of employment outlined in a contract of employment (see Contract). Temporary Contract – see Fixed Term Contract. Temporary Employment (aka Temporary Work) – is where an employee is expected to remain in a position with an employer for a certain period of time. Tolpuddle Martyrs – in 1834, farm workers in Tolpuddle, Dorset formed a trade union to combat the year on year cuts to their pay and to defend their families. Unions were lawful and growing fast at the time but six leaders of the union were arrested and sentenced to seven years’ transportation for taking an oath of secrecy. In the wake of this, a massive protest swept across the country with thousands of people marching through London with further petitions and protest meetings to demand their freedom. The protest campaign was successful and the Tolpuddle Martyrs returned home in triumph. Trades Council – Trades Union Councils bring together unions to work and campaign around issues affecting working people in their local workplaces and communities. Trades Union Councils aim to raise public awareness of rights at work and the union role in enforcing those rights, promote organising and recruitment drives to build union membership and support union and community campaigns for dignity and respect in the workplace and beyond. Trade Union – are large working class based organisations made up of workers who join forces for the purpose of maintaining or improving the conditions of their employment in a collective defence of their interests and to advance those interests in the face of an unequal balance of power between capital and labour. Trade Union Congress (TUC) – is the congress of trade unions in Britain, with 54 affiliated unions representing 6.2 million working people from all walks of life. The TUC campaign for a fair deal at work and for social justice at home and abroad. The TUC negotiate in Europe, and at home build links with political parties, business, local communities and wider society. Trade Union & Labour Party Liaison Organisation (TULO) – is the umbrella organisation that coordinates the activities of the 15 trade unions that affiliate to the Labour party, of which Unite is one. Transport and General Workers Union (TGWU)(T&G) – The Transport and General Workers’ Union (T&G) was founded in 1922 and formed by 14 small trade unions in the dock, road transport and inland waterway industries coming together to create one big union to serve 350,000 workers. In May 2007, Transport and General Workers Union (TGWU/T&G) merged with the Amicus to form Unite the Union. Treasurer – is an elected branch official who is responsible for managing branch finances and keeping accounts in accordance with the rules of the union. The Treasurer provides reports on the financial position of the branch to the branch committee at meetings and provides an audited quarterly and annual return of branch income and expenditure to the Regional Finance Officer. TUPE – is the colloquial term for the Transfer of Undertakings (Protection of Employment) Regulations (2006). TUPE is an important piece employment law that protects employees whose employer is being transferred to another business or owner. Tutor – delivers education courses on a variety of trade union based courses. e.g. Shops Stewards and Health and Safety Representative courses. Union Learn (UL) – is the learning and skills organisation of the TUC. Union Learn works to assist unions in the delivery of learning opportunities for their members as well as managing the Union Learning Fund (ULF). Union Learning Fund (ULF) – the union learning fund supports union learning projects to transform the lives of their members in developing skills, achieving qualifications and promoting lifelong learning opportunities within the workplace. Union Learning Organiser (ULO) – are organisers based within the education department and promote the Learn with Unite platforms in the regions and raising awareness of Lifelong Learning across all industrial sectors and in the community. Union Learning Organisers promote and encourage workers’ engagement in all aspects of learning and skills development, are responsible for recruiting and developing Union Learning Reps (ULR) and building sustainable support networks within the Unite regions. Union Learning Representative (ULR) – is recognised by their employer, and elected by members in their workplace. ULRs have been instrumental in championing the importance of training and development. ULRs work very hard to boost the image and strengthen the organisation of the union within the workplace and can help widen union membership across the board and in underrepresented groups such as migrant workers. Union Solidarity International (USi) – is an organisation supported by major UK, Irish and trade unions in countries such as Brazil, Greece, Austria, North America, Europe, South Africa and Australia that aims to build grassroots international union solidarity using the latest technology. USi link trade union activists from around the world directly with each other so they can create and lead campaigns for a fairer and more sustainable world. Unite along with other unions and organistions help initiate USi. Unionised – being a member of or organise a work place to become part of a trade union. United Steelworkers of America (USW) – Unite’s sister union in North America which is the continents’ largest private sector union. Together Unite and USW combine to make Workers Uniting: The Global Union (see Workers Uniting). Unite House – is the Registered Office of Unite the Union, located at 128 Theobald’s Road London, WC1X 8TN. Unite Migrant Workers Education Project (UMWEP) – is a non-profit organisation under the umbrella and sponsorship of Unite the Union, which promotes Equality and Diversity by attracting as many different minority/ethnic groups as possible. UMWEP implements an Alternative Education Model (AEM), which methodology and pedagogical concepts apply realistically to the true education needs of our learners. Unite the Union – Unite is Britain and Ireland’s biggest union with 1.42 million members in every type of workplace and in the community. Unite is a democratic and campaigning union which fights back for employees in the workplace, is taking trade unionism out to the millions of unorganised workers, is a union that stands up for equality for all and advances its members interests politically. Unite is also active on a global scale building ever stronger links with trade unions around the world to confront the challenges of the globalised economy. Unity Trust Bank – is the bank in the United Kingdom that is used for the purposes of Unite branch accounts and banking. Vice Chair – is an elected official and is deputy to the chair of a committee or branch. The vice chair will act as chair in such instances where the chair is absent and facilitate meetings and make sure that business is properly conducted in line with union democracy and policy. Victimisation – is when someone treats you badly or subjects you to a detriment because you complain about discrimination or help someone who has been the victim of discrimination. Voluntary Redundancy – occurs when an employer offers a financial incentive for employees to leave a company voluntarily, in order to avoid having to select people for redundancy. Voluntary redundancy still constitutes a dismissal and all the same rules apply as a compulsory redundancy (see Redundancy). Wage Negotiations – is a process of negotiation and bargaining by trade unions with employers to reach an agreement regarding pay for members. Wales Trade Union Congress Cymru (Wales TUC) – is the congress of trade unions in Wales with 50 affiliated trade unions representing nearly half a million workers. The Wales TUC is the voice of Wales at work. The Wales TUC campaign for a fair deal at work and for social justice at home and abroad. Workplace Branch – is a union structure organised to represent the union’s members from a particular workplace. Works Council – there are two of Works Council; a council composed of both employers and employees convened to discuss matters of common interest concerning a factory, plant, business policy, etc, (not covered by regular trade union agreements). A Works Council can also be a body representing the workers of a particular site, elected to negotiate with the management about terms and conditions. Women’s Committee – There are regional and a national Women’s committees made up of elected representatives who deal with issues pertaining to women in the workplace, community and society. Women’s Conference – there is to be a Women’s Regional Conference every three years and a Women’s National Conference every two years to be convened by the Regional Secretary and Executive Council respectively. The conferences will determine Women’s policy and strategy regionally and nationally until the next conferences take place. Xenophobia – is the dislike of or prejudice against people from other countries. Young Members – is a member up to and including the age of 30. Young workers deserve to be treated with dignity and respect at work and not to be discriminated against, harassed or patronised due to their age. Unite’s young members have identified key issues for our union to campaign on to ensure equality for all, regardless of age. Young Members’ Committee – There are regional (RYMC) and a national (NYMC) Young Members’ committees made up of elected representatives who deal with issues pertaining to young members in the workplace, community and society. Young Members’ Conference – there is to be a Young Member’s Regional Conference every three years and a Young Members National Conference every two years to be convened by the Regional Secretary and Executive Council respectively. The conferences will determine Young Members’ policy and strategy regionally and nationally until the next conferences take place. Young Members’ Observer – is elected from the Young Members’ National Committee to be an observer delegate on the Executive Council. Zero Hour Contract – ‘zero hours’ is not defined in legislation, but is generally understood to be an employment contract between an employer and a worker, which means the employer is not obliged to provide the worker with any minimum working hours, and the worker is not obliged to accept any of the hours offered. Most zero hours contracts will give staff ‘worker’ employment status. Zero hours workers have the same employment rights as regular workers, although they may have breaks in their contracts, which affect rights that accrue over time. 100% Campaign/100% UNITE – was officially launched in November 2011, following months of extensive information gathering, research and planning. The Union has taken a clear decision to focus officer resources on building and developing workplace organisation. The development and maintenance of effective shop steward leadership at the place of work, is considered critical to the success of 100% UNITE. 3 Pillars Strategy – is Unite’s strategy of building and maintaining the strongest union in Britain and Ireland and delivering the best of everything for members through the pillars of organising, politics and international solidarity. Geographical (for the place where they live). 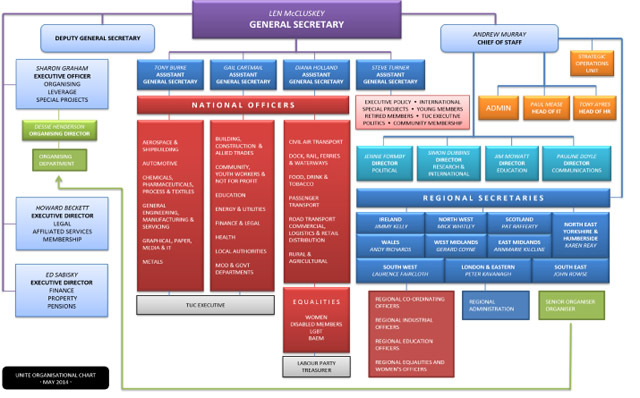 Because we are such a massive organisation with 10 regions and 21 industrial sectors, plus representation for underrepresented groups such as disabled members, women, LGBT, BAEM, retired members and young members, an organisation chart does on first inspection look incomprehensible. Thankfully it isn’t. The main Parliament of the union is the Biennial Policy Conference. Because this only meets once every two years an Executive Council is elected which meets four times a year each in a five-day session. The strategic and normal day-to-day activities are decided by the policies laid down by the policy conference and the guardians of this are the elected lay (nonpaid) representatives on your Executive Council. In order to give our democratic structure guidance and leadership, a General Secretary is elected by the whole membership once every five years. And what you see in the diagram is a whole lot of different positions in the union. All are accountable to the General Secretary who in turn is directly accountable to the Executive Council and the Policy Conference. As an enormous organisation we have to create functions to ensure that things run smoothly. Basically this is detailed in the diagram. For the day-to-day running of the union as it impacts on you as young members, the most immediate line of accountability to you is your regional official, each has an allocation for which they are responsible to the Regional Secretary. In addition, because the essential role of the trade unions to collectively bargain on behalf of its members, we have a range of national officials who bargain with your employers at national and local level. Supporting your regional officers and their national equivalents is a nest of functionaries working in research, HR, IT, legal, finance, communications, education, international, administrative and political departments. They are a sort of civil service to the union. There is a parallel structure in our Organising and Leverage Department which runs alongside the work undertaken by your region officials. What the diagram does for you is to allow you to follow the lines of accountability and reporting. It gives you a helicopter view of the union and where the pieces fit together. Once you get involved and become active, you will be reassured to learn that is a bit like the London underground system. It looks confusing and impenetrable. But once you start to get busy and understand the picture, it is relatively straightforward. And if you do encounter problems, hiccups or barriers then simply have a wee chat to your workplace rep or your regional official. The more you use the system then the better the opportunities to maximise your participation. And enjoy being an activist in UNITE. Unite is constituted into 10 regions – Ireland (Northern Ireland and the Republic of Ireland), Scotland, Wales and 7 regions in England based upon the Regional Development Agency boundaries: North West; North East Yorkshire and Humberside (NEYH); West Midlands; East Midlands; South West; South East; London and Eastern. Each region has a Regional Secretary who is responsible for the running of the region and has a regional office and district offices. 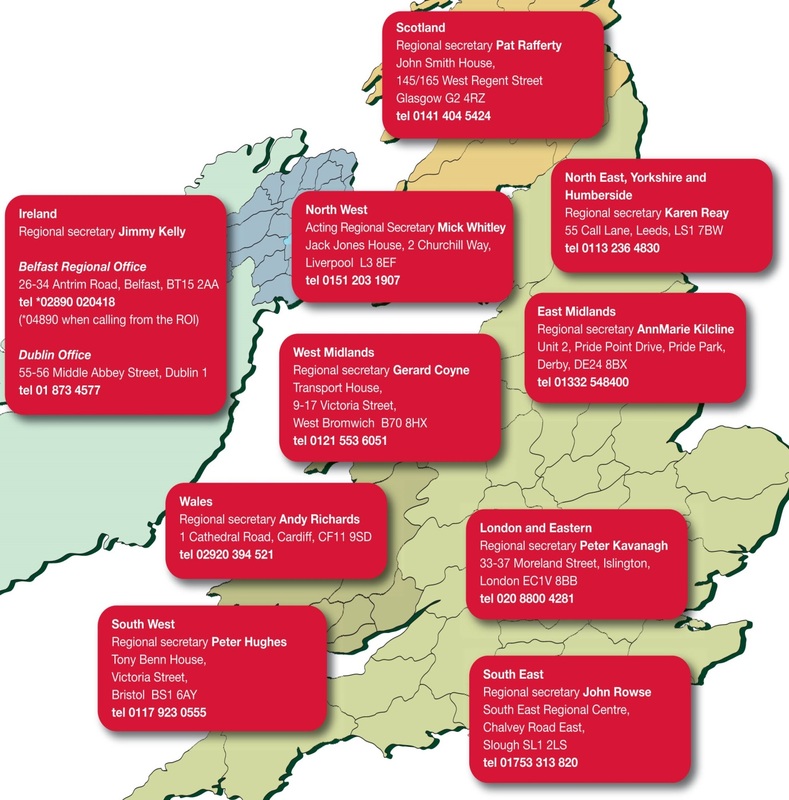 Below are the regions, Regional Secretaries and contact details for all Unite offices and residential education centres. Region Regional Office Regional Office Contact No. District Offices District Offices Contact No. Unite Head Office Unite, Unite House, 128 Theobald’s Road, Holborn, London, WC1X 8TN 020 7611 2500. Unite has 21 industrial sectors. Each industrial sector has a Regional Industrial Sector Committee (RISC) and National Industrial Sector Committee (NISC) over seen by a respective Regional Officer and National Officer. Aerospace & Shipbuilding – the sector covers civil and military aircraft design, manufacture, maintenance, repair and overhaul, the UK space industry, shipbuilding, marine and ship repair and defense equipment manufacturing. Automotive Industries – is the sector covering the whole of the UK automotive industry – from the design of vehicles to roadside rescue and repair. Unite represents members working in the supply chain, including the design, production, manufacture, warehousing and installation of parts and components for all vehicles including installation of windscreens, exhausts, navigation, illumination equipment, breakdown recovery and repair of all types. Unite also covers agency workers, apprentices, trainees, supervisors and managers in vehicle manufacturing companies. Building, Construction and Allied Trades – Unite is now the sole or joint signatory union to every significant national collective agreement across the whole of the UK construction industry and also throughout the construction products supply chain. At the heart of our industrial activity is the core policy that Unite wants to see – all construction workers directly employed under the terms and conditions of the collective agreement relevant to their trade. Chemicals, Pharmaceuticals, Process & Textiles – these sectors have highly skilled workers working to the highest health, safety and environmental standards. Unite’s membership in the industries extends across production, engineering and maintenance, supervisory, scientific research, administration, marketing and sales, and management grades. Membership also includes workers in oil refineries, on offshore oil platforms, chemical production, life sciences, the production of glass, rubber, ceramic products and the textiles industry. Civil Air Transport (CAT) – Civil aviation is one the largest and most critical sectors for the UK economy. Unite is the dominant union within civil aviation, with the largest membership found in every area of the industry – from engineering and cabin crew to check-in and administration. Unite provides a strong campaigning voice in the dynamic and ever-changing airline industry. campaigning organisations, professional bodies, trade unions, advice and legal bodies, youth and play workers, housing associations, faith organisations, non-departmental public bodies, funding agencies and many other workplaces, from the very large to those that employ only one or two people. Docks, Rail, Ferries & Waterways – Over the coming years the decisions that the government and businesses make in relation to strategy and investment will shape the transport system and determine the infrastructure for economic development. Unite will seek to influence these decisions to ensure a modern, efficient and, most importantly, an integrated structure. Unite are continuing to develop and create strategy to organise in this industrial sector. Education – Unite organises workers in all areas of education in the UK and Ireland. Our members work as research, technical, IT, administrative, estates, support and maintenance staff. Energy and Utilities – Unite is the foremost union in energy with members in every form of power generation, as well as in distribution, network and retail operations. In addition, Unite has members in a broad range of occupations across the UK water industry. Unite is effective and well organised in the sector thanks to high Union density and longstanding recognition agreements. Food, Drink & Tobacco (FDT) – The food and drink sector is the largest manufacturing sector in the UK and employs around 400,000 people, or approximately 17% of the UK’s manufacturing workforce. Unite has members working for companies such as Unilever, Kraft / Cadbury, Nestlé, Princes, Greencore, Bakkavor, Heinz and Coors Brewing. The sector also includes many of the 800,000 workers in retail food, with a substantial presence in supermarkets such as Sainsbury’s where our 17,000 members make it one of the largest single companies represented across the whole of Unite. Finance & Legal – Unite’s finance and legal sector is comprised throughout all major employers in banking and insurance. Unite campaigns tirelessly on the issues important to our members, including pay, job security, divestment, offshoring and outsourcing, as well as cutting edge campaigns. General Engineering, Manufacturing & Servicing (GEMS) – this new sector combines the Electrical Engineering and Electronics sector with the Servicing and General Industries sector. It covers members working in the design, production, manufacturing and maintenance of electrical and associated products, electrical Through UKAPE Unite represents professional engineers across the UK who are either chartered or working towards chartership, and other professionals providing a service to the public components, semi-conductors, turbines, electronic goods and domestic appliances. Graphical, Paper, Media & Information Technology (GPM & IT) – covers workers in the UK and the Republic of Ireland who are employed in the graphical, paper and media industries, including both production workers and administrative staff, and a wide range of members in the information technology and communications industries. Health – Unite is the leading trade union in the health sector, with over 100,000 members across all occupations and professional groups. We work tirelessly to campaign against the current NHS Reforms and to support, protect and advance all our members interests in health. In this section you will find the latest campaigns, news, events and resources relating to the sector including information about all the occupational and professional groups. Local Authorities – Unite represents an extremely diverse group of members working in street cleansing, waste management, recycling, school support, estates and maintenance, police, criminal justice, social care, ICT and administration. As Britain’s biggest union in the private sector, Unite also provides an expert lead in organising and providing representation in private companies and contractors where the work has been outsourced by local authorities. Manufacturing – is the lifeblood of any modern economy and is a key section of Unite. The manufacturing section in Unite covers over 500,000 workers in aerospace, defense and shipbuilding, science, chemicals, pharmaceuticals, process and textiles, printing, publishing, papermaking, packaging, metals and steel, automotives and vehicle production, automotive components, information technology, communications, general engineering, electrical engineering, electronics, servicing, general manufacturing, Royal Mail management and other professional and skilled workers. Metals (including Foundry) – covers workers employed in the steelmaking industry, notably in Tata Steel and Sahaviriya Steel Industries (SSI UK). In addition the sector represents Unite members in foundries, aluminium manufacture, the production of castings and coils for steel and also in precious metals. Unite also represents management and technical grades in the steel industry through the Steel Industry Manages Association. Ministry of Defence & Government Departments (MOD & GOVT DEPTS) – Unite has an active and well organised membership in the Ministry of Defence, the Prison Service, research establishments and self-contained entities such as the Royal Mint. We also have a significant number of members who were formerly employed by the Civil Service and whose jobs have been outsourced or privatised. organisation for licenced taxi drivers, who in the main are self-employed, but the union represents the collective interests of the trade at all regulatory levels. Road Transport Commercial, Logistics & Retail Distribution (RTC) – Unite’s road transport commercial, logistics and retail distribution sector covers driving and non-driving staff in the biggest companies in the industry. Unite is THE union for transport workers and lead negotiations to improve terms and conditions for thousands of members. The sector organises across all areas of the industry from chilled distribution to car delivery. Unite is also the union for all warehouse and depot workers. Rural & Agricultural – Unite’s rural and agricultural sector, which in its current and predecessor forms has represented the interests of agricultural workers since 1906, covers members that work in areas as diverse as poultry, horticulture and forestry. Unite is expanding its membership to include people working within larger farms and in the organic sector. Unite also has a strong presence in forestry, representing workers in the Forestry Commission and private forestry. Unite is firmly committed to equality for all, and as well as industrial and regional structures our equalities structures ensure full representation and involvement of our diverse membership. Unite’s mission is to organise people to strive for a society that places equality, dignity and respect above all else. But our union recognises that we can only achieve this if we bring people together from all walks of life. Even now in the 21st century, too many people in the United Kingdom and Ireland are being pushed to the margins of society. They deserve to be heard; they too deserve the support to organise collectively. It is with this in mind that Unite has founded its community membership scheme. Unite’s community membership scheme brings together people from across our society. Those not in employment are welcomed into the union family, adding another dimension to our strength in thousands of workplaces across the UK. Unite has a Community Coordinator in every region tasked with developing and nurturing community membership through the establishment of community branches and focusing on bread and butter issues which affect communities in the wake of the recession and the detrimental effects it has had at grass roots level. To ensure the day to day running and management of the union, and providing the best help, support, facilities and affiliated services for our members Unite has 9 different central departments. Each department is speared headed by a Director to provide the best membership services for our members. Most unions like Unite are members of one or more Global Union Federations (GUFs), relevant to the sectors where they have membership. Unite organise across 21 industrial sectors and affiliate and associate with several GUF’s. Below are the main GUF’s Unite affiliates to in Europe and globally. Building and Wood Workers’ International (BWI) – is the global union federation grouping free and democratic unions with members in the Building, Building Materials, Wood, Forestry and Allied sectors. The BWI groups together around 328 trade unions representing around 12 million members in 130 countries. European Federation of Building and Woodworkers (EFBWW) – is the European Industry Federation for the construction industry, the building materials industry, the wood and furniture industry and the forestry industry. The EFBWW has 50 affiliated unions in 17 countries and represents a total of 2,300,000 members. The EFBWW is a member organisation of the European Trade Union Confederation (ETUC). European Federation of Food, Agriculture and Tourism (EFFAT) – is the European Federation of Trade Unions in the Food, Agriculture and Tourism sectors representing 120 national trade unions from 35 European countries and defends the interests of more than 2.6 million members towards the European Institutions, European industrial federations and enterprise management. As a member of the ETUC, EFFAT promotes its members’ interests in all European interprofessional issues jointly and with strength. European Trade Union Confederation (ETUC) – was founded in 1973 to represent and promote workers’ interests at European level. It is made up of 85 national trade union federations in 36 countries and 10 European trade union federations. The European Union, the Council of Europe and the European Free Trade Association all recognise the ETUC as the only cross-sectoral trade union organisation representing workers at European level. European Trade Union Institute (ETUI) – is the independent research and training centre of the European Trade Union Confederation (ETUC). The ETUI places its expertise in the service of workers’ interests at European level and of the strengthening of the social dimension of the European Union. European Federation of Public Service Unions (EPSU) – is the largest industry federation within the European Trade Union Confederation (ETUC). It speaks on behalf of over 216 public sector unions representing approximately 8 million organised workers in more than 36 European countries. Unite is an affiliate of the EPSU. European Transport Workers’ Federation (ETF) – is a pan-European trade union organisation which embraces transport trade unions from the European Union, the European Economic Area and Central and Eastern European countries. The ETF represents some three million workers from 39 European countries and affiliated unions which organise workers in railways, road transport, maritime transport, ports and docks, inland navigation, civil aviation, fisheries and tourism services. General Federation of Trade Unions (GFTU) – is a federation for specialist unions with 21 affiliates. GFTU provide a range of support and services for affiliates including education and research. IndustriALL- Europe – European trade unions from the manufacturing sectors of metal, chemical, energy, paper, mining and textiles have7 million members in more than 230 organisation., IndustriALL-Europe is committed to building an even stronger European Trade Union Federation, to improve the conditions for the industrial workers and employees in Europe and to ensure that industrial manufacturing and development continues to be a cornerstone for growth and prosperity in the European countries. IndustriALL Global Union – represents 50 million workers in 140 countries in the mining, energy and manufacturing sectors and is a new force in global solidarity taking up the fight for better working conditions and trade union rights around the world. IndustriALL Global Union represents workers in a wide range of sectors from extraction of oil and gas, mining, generation and distribution of electric power, to manufacturing of metals and metal products, shipbuilding, automotive, aerospace, mechanical engineering, electronics, chemicals, rubber, pulp and paper, building materials, textiles, garments, leather and footwear and environmental services. International Transport Workers’ Federation (ITF) – is an international trade union federation of transport workers’ unions. Any independent trade union with members in the transport industry is eligible for membership of the ITF. 708 unions representing over 4.5 million transport workers in 154 countries are members of the ITF. It is one of several Global Federation Unions allied with the International Trade Union Confederation (ITUC). International Union of Food, Agricultural, Hotel, Restaurant, Catering, Tobacco and Allied Workers’ Associations (IUF) – is an international federation of trade unions representing workers employed in: agriculture and plantations, the preparation and manufacture of food and beverages, hotels, restaurants and catering services all stages of tobacco processing. The IUF is currently composed of 336 trade unions in 120 countries representing a combined representational membership of over 12 million workers. Public Services International (PSI) – is a global trade union federation representing 20 million working women and men who deliver vital public services in more than 150 countries. PSI membership work in social services, health care, municipal services, central government and public utilities such as water and electricity. PSI champions human rights, advocates for social justice and promotes universal access to quality public services. PSI works with the United Nations system and in partnership with labour, civil society and other organisations. Union Network International (UNI) – UNI Global Union is the voice of 20 million service sector workers around the world. Through 900 affiliated unions, UNI represents workers in 150 countries and in every region of the world. UNI represents workers in the Cleaning & Security; Commerce; Finance; Gaming; Graphical & Packaging; Hair & Beauty; ICTS; Media, Entertainment & Arts; Post & Logistics; Social Insurance; Sport; Temp & Agency Workers and Tourism industries.